Sony introduced an exciting new addition to its highly popular compact camera line-up on 3 April with the launch of the world's smallest and lightest premium compact camera, the RX0 II (model DSC-RX0M2). 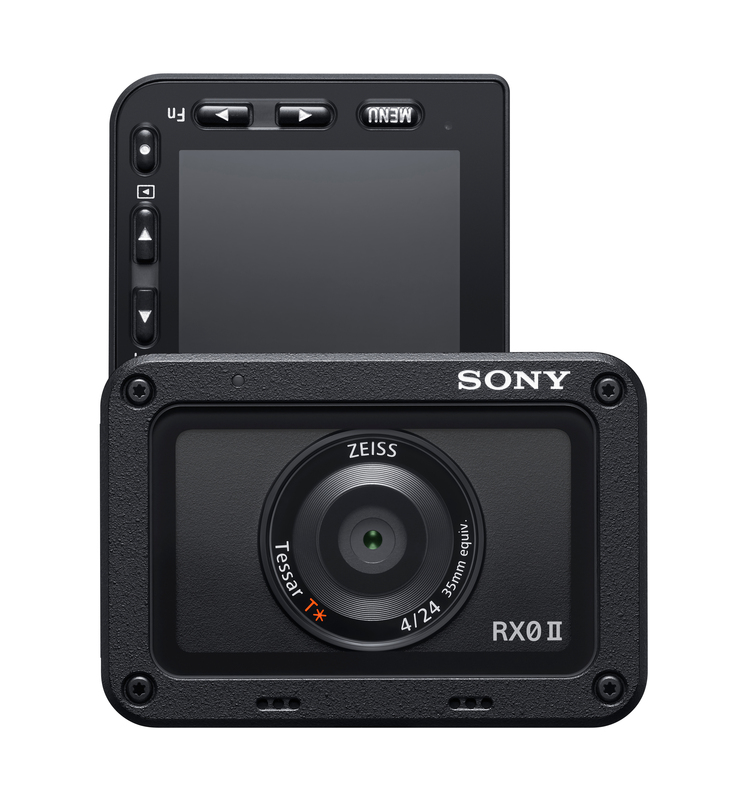 Building upon the waterproof/dustproof, shockproof, crushproof and ultra-compact qualities of the original RX0, the new model now offers internal 4K recording, an up to 180-degree and down to 90-degree tiltable LCD screen that even works underwater and new image stabilisation solutions for video recording. At the heart of the RX0 II sits a 1.0-type stacked 15.3- megapixel Exmor RS™ CMOS image sensor and an advanced BIONZ X™ image processing engine that offer enhanced colour reproduction including beautiful skin tones. This power packed combination has been optimised to deliver lightning fast performance and exquisite image quality for both stills and movie shooting across a wide sensitivity range of ISO 80 -12800. The ZEISS® Tessar T* 24mm3F4.0 fixed wide-angle lens has a shortened minimum focusing distance of 20cm, making it perfect for selfies or table-top photos. The RX0 II is truly a ‘worry-free’ camera that can be taken into places that no other camera can go. Measuring just 59mm x 40.5mm x 35mm and weighing just 132g, the RX0 II fits easily into a pocket and is ready for whatever the elements can throw at it. It is waterproof up to 10 metres deep, dustproof and shockproof up to 2 metres high, and resistant of forces up to 20kg. The RX0 II offers 4K 30p internal movie recording with full pixel readout and no pixel binning to collect approximately 1.7 times the amount of data required for 4K video. This oversampling reduces the appearance of moiré and jaggies and delivers smooth, high quality 4K footage with exceptional detail and depth. Using the recently introduced Sony “Imaging Edge™” mobile applications, this footage can be transferred to a smartphone, edited and shared easily across social networks. The RX0 II introduces in-body electronic stabilisation for steady video footage, even when shot handheld. This can be enhanced even further when footage is exported to a smartphone or tablet running the ‘Movie Edit add-on' application where the additional information captured during filming can be processed to produce a video with gimbal-like smoothness. An additional new feature that can be accessed via Sony ‘Movie Edit add-on’ is ‘Intelligent Framing’ where the selected subject is kept in the centre of the frame and image distortion is corrected in a final edit. Depending on where the video will be shared, the required aspect ratio can then be selected. The versatility of the RX0 IImeans that it offers a host of stills photography features in addition to its video capabilities. It boasts an Anti-distortion Shutter of up to 1/32000 sec. and can shoot at up to 16 fps5to capture any fleeting moment of emotion that passes across the subject’s face. In an upgrade from the original RX0, colour reproduction has been enhanced to reproduce natural and vivid colour of human skin, and the optional ‘Soft Skin Effect’ can be applied to cover minor blemishes and wrinkles. Rating and Protect functions can be applied in camera and a grouped display of continuously shot images can be viewed on the camera. Sony’s Eye AF that is proving hugely popular with portrait photographers across the world, has been upgraded on the RX0 II. The speed, accuracy and operation of the Eye AF has been improved to make it even easier to capture a stunning portrait; a simple half press of the shutter button will lock-on to the eye of the subject. The focused eye can be selected (left / right / auto) in the menu or assigned to a custom button, allowing the user to concentrate on composition. Up to 5 RX0 II cameras can be controlled wirelessly using Sony ‘Imaging Edge Mobile' application and between 6 to 50 cameras via an access point (scheduled for Summer 2019.) The RX0 II is also compatible with the Camera Control Box CCB-WD1 which enables up to 100 cameras to be connected and controlled in a wired multi-camera setup. Both of these multi-camera solutions unlock a whole new world of shooting opportunities and free video expression from any viewpoint that the user wishes to pursue. For more information on the new RX0 II camera, please visit its product page here. The new RX0 II will be available in Malaysia from May 2019 at RM 2,799. On the same day, Sony also introduced an exciting new addition to its E-mount mirrorless camera lineup – the α6400 (model ILCE-6400). The α6400 brings many of Sony’s most advanced technologies from their acclaimed full-frame lineup to a compact, lightweight APS-C camera. The speedy new camera boasts the world’s fastest autofocus (AF) acquisition of 0.02 seconds, while also introducing the new advanced “Real-time Eye AF” and ”Real-time Tracking” capabilities. Other features include high-speed shooting up to 11 fps with AF/AE tracking, a new-generation BIONZ X image processing engine that produces excellent image quality, 4K video recording, a fully 180-degree tiltable LCD touch screen and much more, making it the ultimate tool for all types of creators ranging from professionals to everyday vloggers. The impressive autofocus system on the new α6400 inherits many technologies from Sony’s newest line-up of full-frame cameras including the α9, α7R III and α7 III models. The new camera features 425 phase-detection AF points and 425 contrast-detection AF points that are placed densely over the entire image area, covering approximately 84 percent of the image area. This high-speed, high-performance tracking AF system is paired with a new-generation BIONZ X image processing engine that together allow the camera to acquire focus in as little as 0.02 seconds and maintain subject lock extremely effectively, ensuring even the fastest moving subjects can be tracked and captured with ease. The α6400 introduces advanced “Real-time Eye AF,” the latest version of Eye AF technology. This exciting new capability employs artificial intelligence (AI) based object recognition to detect and process eye data in real time, resulting in improved accuracy, speed and tracking performance of Eye AF. In all autofocus modes, the camera now automatically detects the eyes of the subject and activates Eye AF with a half press of the shutter button, and when in AF-C or AF-A mode, the preferred eye of your subject can be selected as the focus point. This exciting new technology completely frees the photographer to focus solely on composition with full trust that focus will be tack sharp on the subject’s eye. Eye AF support for animals will be added in summer 2019 via a system software update, ideal for wildlife photographers. Another debutant on the α6400 is Sony’s newly developed “Real-time Tracking.” This mode utilises Sony’s latest algorithm including artificial intelligence (AI) based object recognition and processes colour, depth, brightness as spatial information to ensure that all subjects can be captured with excellent accuracy. Additionally, when photographing or videoing humans or animals, face and eye position information is recognised by AI and the subject’s eye is monitored in real time with extremely high tracking precision. This can be activated by a simple half press of the shutter button, or can be assigned to a custom function as well. 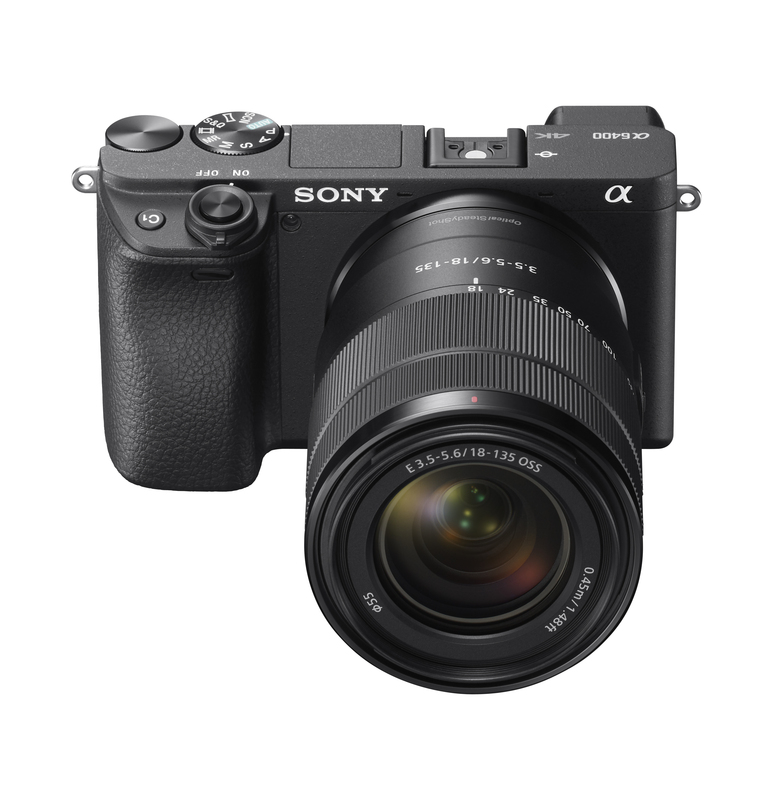 Sony’s new α6400 is equipped with a 24.2 MP APS-C sized image sensor which is paired with an upgraded BIONZ X processor to deliver incredible advancements in image quality and colour reproduction in all types of shooting conditions. Standard ISO ranges up to ISO 32000 for both still and movie, and is expandable up to ISO 102400 for still images, with excellent noise reduction at medium and high sensitivities. The versatile α6400 is an exceptional video camera, offering internal 4K movie recording with full pixel readout and no pixel binning to collect about 2.4x the amount of data required for 4K movies, and then oversamples it to produce high quality 4K footage with exceptional detail and depth. Focusing during movie shooting is fast and stable thanks to upgraded Fast Hybrid AF technology, which keeps the subject in constant smooth focus no matter the scene, and even if an object crosses in front of the camera. This advanced AF plus touch focus functionality make it an ideal camera choice for many vloggers and video creators that are regularly creating and uploading content online. Additionally, for the first time in Sony APS-C mirrorless camera, the new model includes an HLG (Hybrid Log-Gamma) picture profile, which supports an Instant HDR workflow, allowing HDR (HLG) compatible TVs to playback beautiful, true-to-life 4K HDR imagery. Furthermore, both S-Log2 and S-Log3 are available for increased colour grading flexibility, as well as Zebra functionality, Gamma Display assist and proxy recording. The camera can also record Full HD at 120 fps at up to 100 Mbps, allowing footage to be reviewed and eventually edited into 4x or 5x slow-motion video files in Full HD resolution with AF tracking. The new camera is designed to offer high levels of functionality and customisation to maximise shooting freedom. New on the α6400 is a fully 180-degree tiltable, 3.0-type LCD flip screen with 921k-dots of resolution that allows for simple and effective framing of selfie-style shooting for both still and video capture. Utilising this capability, vloggers will be able to check and monitor composition throughout their entire creative process. The LCD screen is also equipped with touch functionality, with options for Touch Pad, Touch Focus, Touch Shutter and new Touch Tracking which quickly activates “Real-time Tracking” through the touch screen. The camera features a high quality XGA OLED Tru-finder™ viewfinder, extensive customisation with 89 functions that are assignable to 8 custom keys, the new My Dial and My Menu functionality, enhanced overall menu usability, a help screen for menus, star rating for images, and many other features that allow for a seamless shooting experience. It is also built with a tough magnesium alloy design, is dust and moisture resistant and has an extremely durable shutter that is rated for approximately 200,000 cycles. It is also capable of seamlessly transferring files to a smartphone or tablet when connected to the brand new ‘Imaging Edge Mobile’ application. The α6400 has been available in Malaysia since March 2019, with prices beginning from RM 3,999.